I found myself surrounded by pricy homes this past week, walking a Galveston Island landscape that once belonged to the infamous Jean Lafitte. He came to the island in 1817, which at the time was mostly uninhabited except for Karankawa Indians. Lafitte battled the Indians and used the island, with its protected bay, as a base for his smuggling and pirating activities until 1821, when he made the mistake of attacking an American merchant ship. The schooner, the USS Enterprise, was sent then to oust him. 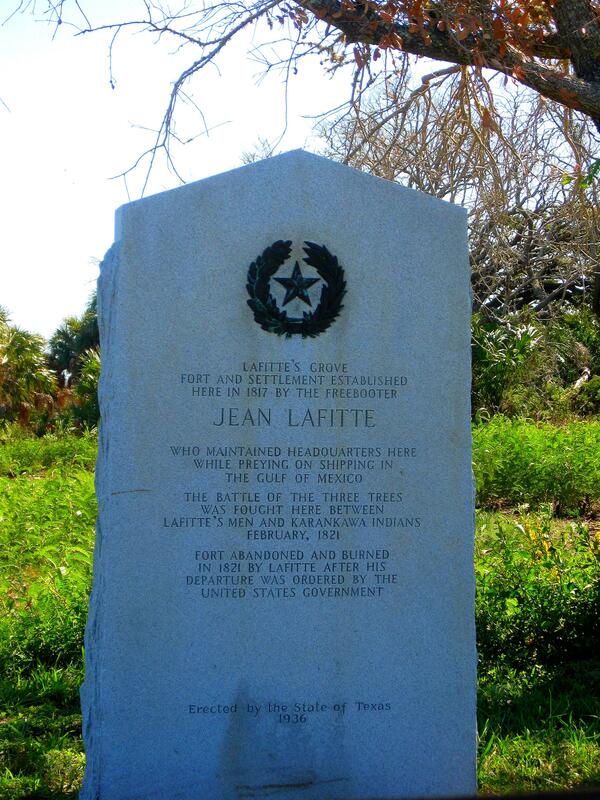 Lafitte agreed to leave the island without a fight, but before he did he burned the settlement and fortress he had created, and is said to have taken a huge amount of treasure away with him. I hadn’t come to the place for its historical significance, however. I had come in search of birds in the small sanctuary that sat in the middle of the residential neighborhood. In honor of Lafitte– although I’m not sure what there is to honor, except that perhaps along with his nefarious pirating activities he helped Andrew Jackson defend New Orleans in 1815 – the sanctuary was dubbed Lafitte’s Cove Nature Preserve. Its boardwalk and paved paths wander past a wetlands area, a small lake and though thick woodlands; its location, just inland from the gulf, makes it an ideal stopover for birds migrating along the coast. On the day my son, Lewis, and I birded the preserve, we saw mottled ducks, blue-winged teals, mallards, white-eye vireos, orange-crowned warblers, cardinals, mockingbirds, brown thrashers, black-throated-green warblers and blue-headed vireos, which I thought was a pretty good number for a very windy day in October. 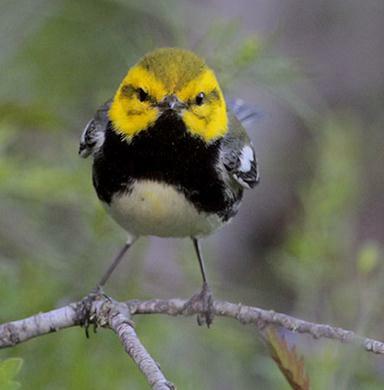 Lewis, who had birded the small sanctuary in May, said he had seen at least triple the number of species on that outing. Wouldn’t it be nice, I thought, if every residential neighborhood saved a small patch of land for the birds. Don’t you agree? Oh that birdie shot is priceless!